Previously run as a B&B..Lots of privacy..
Wake up to the music of birds singing, look out your window and what do you see? Beautiful huge cypress trees bordering the Guadalupe River. If you are lucky you may spot a blue heron, a drinking deer, or a at least a lazy turtle on a lost floating branch. This beautiful property is situated on one acre of land (1491 Edwards Blv. 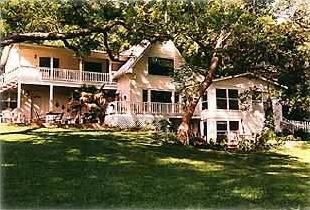 New Braunfels Texas 78132 ) and encompasses 165 feet of waterfront. There is a floating dock housing three canoes and 1 kayak . This Non-Smoking house has eight bedrooms (nine queens, and four singles), six and a half bathrooms, fully-equipped kitchen,piano, two living areas,two dining room tables, 13 beds, (9 queens, 4 singles ), gas grill,barbacue grill, fire ring, 20 cedar addirondack yard chairs, as well as 5 tables and chairs that seat 24 +. Every bedroom and living area has waterview , 168 feet of water front bank, it is 1/2 upstream from Gruene, and three miles from Schlitterbahn. Come enjoy the most beautiful, cool yard in Texas! The property was beautiful. The house easily accommodated our large family, and Maria was very responsive to questions. We look forward to returning in the future. Highly recommend! Beautiful little piece of paradise. We enjoyed a stay over Thanksgiving. The little town of Greune and this house on the river were pretty magical. We did a full Thanksgiving dinner and the house had everything we needed. Thank you for a wonderful week. We had a group of 20 for a birthday weekend and the property was perfect!! Maria is fabtastic and made sure anything we needed was taken care of. I highly recommend this property for your trip. I really appreciate your kindness in taking the time to write the great review. House is spacious with small kitchen that has, however, all appliances. There are numerous bathrooms making it comfortable for a group. The outdoor view of river, trees and sky is beyond beautiful. It is a quiet respite with variety of activities a short drive away. In love with this property! We had 18 people stay over Memorial weekend. We all fit well. There was lots of privacy and no one was on top of each other. The family room was comfy with large furniture. The kitchen had everything we needed. But the outside...oh the outside is so peaceful! Everyone had such a wonderful time. We look forward to our next stay! This is an amazing rental location and house nestled in a bend of the Guadalupe River. We had a family reunion with five families who each had separate, spacious rooms. There are two large living areas that made family conversations easy. The house is close to historic Gruene and located in a quiet neighborhood. Maria, the owner, is warm and personable and accommodated us so graciously. When the weather turned cold, she brought by room heaters to ensure we were comfortable. There are kayaks and life jackets the kids and adults enjoyed using on the river. My daughter writes a lifestyle blog and plans to write about our family reunion and this wonderful house. We would recommend it highly to anyone looking for a place for children and adults to have an enjoyable week or weekend. Just 3 Miles from Shlitterbahn, 1/2 mile upstream from Gruene. which is the historical district from New Braunfels. Gruene is a quaint little village bubbling with restaurants, antiquing, bars,teahouses, wineries ,music, and the 1st Dance Hall in Texas (Gruene Hall) as well as The Gristmill restaurant built on the banks of the Guadalupe River.